In case that was unclear. U.S. securities regulators were united in their decision to file civil charges against billionaire hedge fund owner Steven A. Cohen last week, in a high-stakes case that could result in Cohen being barred from the industry, people familiar with the case told Reuters...In a last-minute 9 a.m. meeting on Friday, with a five-year statute of limitations deadline approaching, enforcement lawyers presented SEC commissioners with a lengthy memo urging them to vote to charge Cohen with failing to supervise former SAC Capital Advisors portfolio manager Mathew Martoma and SAC executive Michael Steinberg, sources said. Both Martoma and Steinberg are facing criminal and civil insider trading charges. SEC Chair Mary Jo White, an independent, and Democratic SEC Commissioners Elisse Walter and Luis Aguilar attended the meeting and subsequently voted in favor of filing charges, these people said. SEC Republican Commissioner Troy Paredes was on a plane en route to Texas at the time, but he cast a yes vote after he landed, according to one of the sources. The SEC&apos;s other Republican commissioner, Daniel Gallagher, was out of town last week and did not participate in any of the SEC&apos;s closed door enforcement meetings. 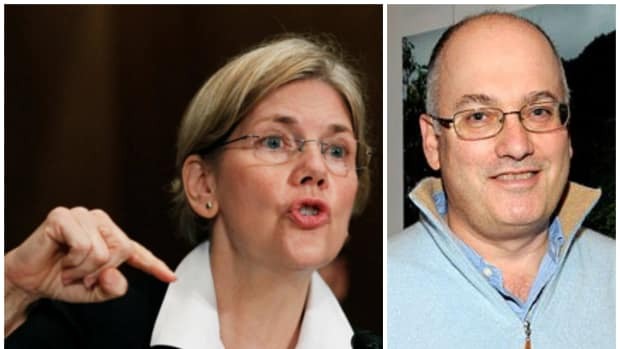 Steve's new fund has Warren asking the SEC "The F@ck?"